Cox Enforcing Flat Data Limits - Downgrade Speed to Save Bandwidth! There are many articles and blog posts around the internet about people that had no idea Cox Communications limits their internet data usage until it was too late, and some were even lied to by Cox employees about data limits beforehand. A few years ago, I was no different. I was a bit annoyed that the Cox website’s pages for internet comparison/shopping did not ever mention a data limit back when I initially chose them for my internet service provider. When I set up an installation over the phone the representative never mentioned data limits, neither did the installation guy when he was going through my services with me after setting things up. Cox purposely avoided telling a potential customer and a new customer about data limits, while making information about data limits on their website hard to find as well. I could only find pages regarding data limits on Cox’s website by searching “Cox Data Limits” on Google! Only recently have they added a mention of the data limits to the website, only instead of saying “1TB Data Limit”, they call it a “1024GB Data Plan”. 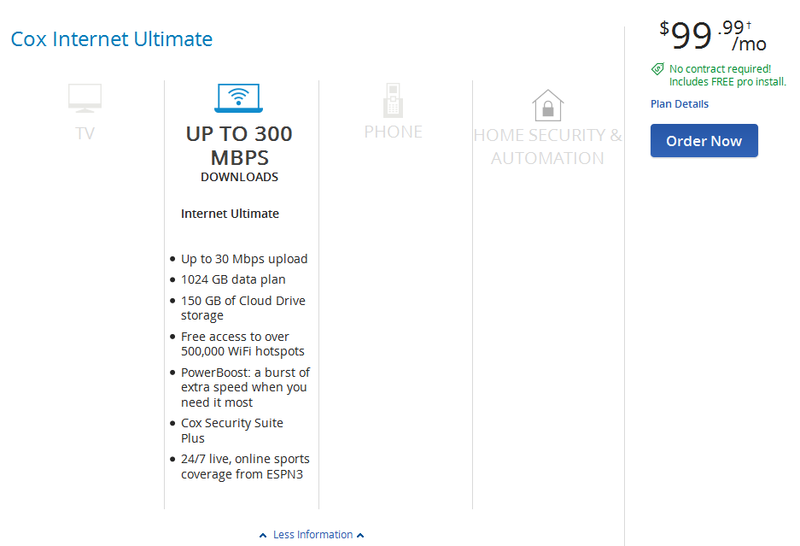 Cox Ultimate Lowered to 1TB data – Ultimately SCREWED! When I got the letter that my Cox data limit was increased to 700GB I went to the Cox site and found the “Data Usage Meter” for my services after a bit of searching. 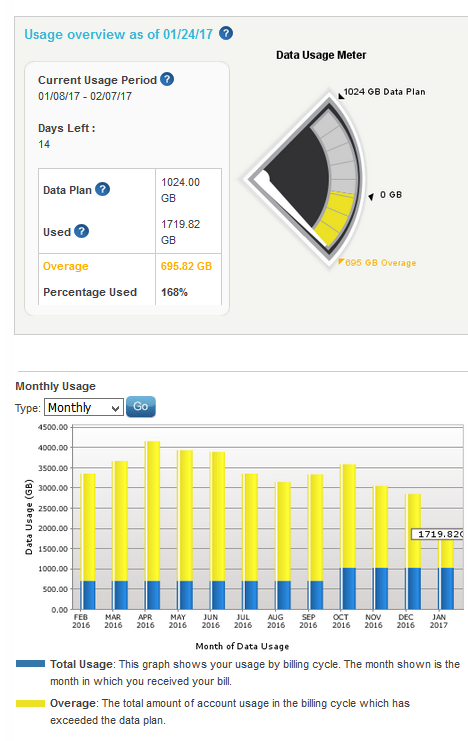 It turned out that my data limit was initially only 300GB, then was shortly raised to 400GB after I started service. I also noticed that three months before the raise to 700GB I was blowing past 400GB due to Netflix and Hulu streaming plus running a couple dozen online-game bots. I was barely under my new 700GB limit, but since Cox had never charged or contacted me about going over the old 400GB data limit I figured I was fine. And I was fine, for about 4 years. Then recently I got a Cox email saying they were raising my limit to 1TB! Sweet, right?! Nope… I then read that ALL Cox packages were placed at a 1TB limit, including the crappiest packages who’s customers pay nowhere near what I pay for internet. The worst part is that customers using the highest Cox internet package, “Ultimate”, were downgraded from 1.2TB data limit down to 1TB. What?!? So now, whether you pay $30 or $100 for internet, you will have a 1TB data limit from Cox Communications. What a joke..
Plus, topping off the bad news from Cox, the email informed me that they would now be charging for data overages in my area. An additional $10 per 50GB. Now that may seem fine, but at the time I received the email from Cox I was heavily into game botting with my Sun Fire X4600 M2 server (32-core, 128GB Ram) and was using far more data than I should have been, an obscene amount… The highest I saw was about 4.2TB in a month. At that rate, had I not seen the email from Cox, my bill after their 2-bill grace period, my internet cost would have jumped from $65 up to $705. I think a letter in the mail would have been nice, perhaps even a telephone call? Obscene Cox Data Usage, Even more Obscene Data Limit! Nope, Cox was ready to send me that $700 bill! First, I rented a root server from Hetzner for $50/mo and moved all my game botting stuff to that. With a monthly limit of 20TB, the Hetzner server should do fine for me… and I was paying $60 in electricity to run my big server, so Hetzner was already saving me money. Now, I think I’m going to lower my Cox Internet package from 150MB/10MB Premier down to 50MB/5MB Preferred or even the 15MB/2MB Essential since they all have the same 1TB data limit. Essential’s 15MB Download speeds and 2MB Upload speeds are fine for Netflix and Hulu streaming, especially if no other devices are online hogging all the bandwidth. The only reason I ever even considered upgrading to Cox Ultimate Internet was for the 1.2TB limit. Once I got this latest email from Cox I would have paid up to $150 to have the same speeds I currently have but with unlimited data usage. That means I was willing to pay over double what I pay just for unlimited data, rather than the hassle of having to rent a dedicated server that actually saves me money.. But no, that’s not an option with Cox.